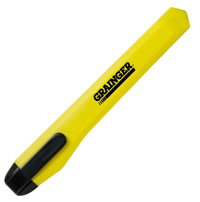 Personalized cutting tools are a sharp way to advertise your name or business. Our cutting tools allow you to print your custom message for name recognition. We carry box cutters, safety cutters and snap blade cutters. Give us a call at - 706-374-0710 - and let us help you select the best blade cutter or other advertising tool for your promotional needs. Free quotes and friendly customer service. Protective sliding cover guards against accidents. Single-edge safety razor blade. Metal body and cover. Item size is 4.13" long x 0.88" wide. Imprint area is 2.5" long x 0.63" high. 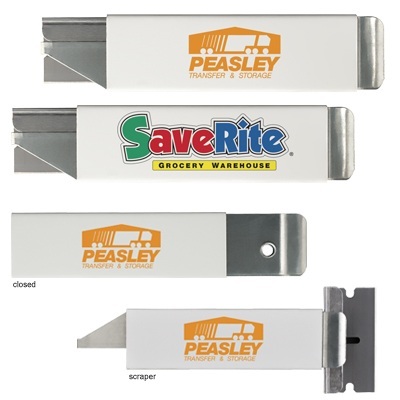 For sharper name recognition, consider advertising your name or business on one of the many different box cutters or other advertising tools offered by Heritage Advertising. 12-section blade with locking slide. Removable slotted top safely breaks blades. Small snap blade cutters have a plastic body and a handy pocket clip. Two body color options are available: white/grey and yellow/black. Item size is 5" long x .75" wide x .56" high. Custom Imprint area is 2" long x .31" high. An additional $55 non-refundable artwork charge per personalized imprint position and color must be paid before work can begin.